She's not a Hollywood newcomer, but Jane Lynch's career really took off after Glee premiered. The smart-talking, tough girl act she puts on as cheerleading coach Sue Sylvester has viewers in stitches in every week. 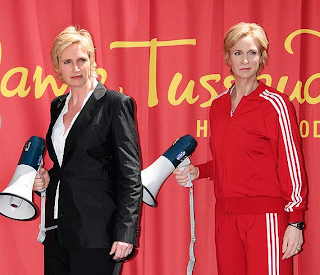 To honor her new role, Madame Tussauds created a Sue Sylvester wax figure. Outfitted in her character's signature red tracksuit, it's hard to tell the two apart! Isn't the resemblance uncanny?